One of the most important steps in any skin care regime is the use of toner. We generally wash our face with warm water, which opens the pores and helps your cleanser do its job. But leaving them open for long leaves them open to dirt. Toner finishes the job your cleanser starts, closes your pores for protection, and restores the pH balance of the dermis, preparing your face for any serums and moisturizers you use. I am particularly partial to toners with rosewater, and here are three of my favorites. 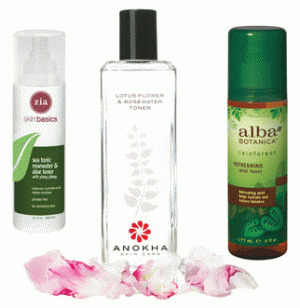 Anokha Lotus Flower and Rosewater Toner—the name says most of it. Along with the rosewater, extract of Burdock root soothes inflammation, the lotus flower stimulates circulation, and gotu kola rejuvenates. This has one of the loveliest rose scents and is packaged in a pretty glass bottle. $22 for 4 ounces. Pevonia’s RS2 Gentle Lotion contains green tea, chamomile, guarana, and rose oil. It is alcohol-free, constricts blood vessels and diffuses redness. It’s great for rosacea, but it left my skin feeling like I could almost (I said almost) do without moisturizer, and it comes in a handy spray bottle. $29 for 6.8 ounces. Zia Skin Basics’s paraben-free Sea Tonic Rosewater & Aloe Toner also comes in a spray bottle. Rosewater combined with aloe soothes and moisturizes as well. The seaweed extract oxygenates and restores minerals, and essential oils of rose and ylang ylang help diminish redness and irritation (not to mention it smells fantastic). About $15 for 6.7 ounces. Two other toners do not use rosewater, but still rank high on my list. Alba Botanica Refreshing Mist Toner uses extract of Tiger Nut to boost elasticity and antioxidant-rich Açaí oil to neutralize free radicals. It’s perfect for extra dry skin! Spray it on and apply your moisturizer while your face is still damp. It can also be sprayed on during the day for a cool refresher. About $15 for 6 ounces. Obagi Nu-Derm system has a great toner that is gentle, and very refreshing. The blend of natural ingredients—barbadensis leaf juice, witch hazel, sage leaf and borago officinalis extracts, and calendula—hydrate while helping to remove dead skin cells. This toner can be found online at anywhere from $15 to $35 for 6.7 ounces. For ease of use, I transfer any toner I use into a recycled spray bottle and I use only 100% cotton pads. All of these products can be purchased online. Alba Botanica can be found in Whole Foods and other natural food stores, and some great toners can be found at department stores or apothecaries.